Porsche made only nineteen right-hand-drive 356 Speedsters. Four of them found their way to the United Kingdom, where two are still in use. Both are marking their sixtieth birthday—the perfect excuse to take “Lady Misty” on a tour through Scotland. It wasn’t all that easy to find our birthday car. Back in 1955, she made a glorious appearance at the Earls Court Motor Show in London, and for the last twenty years has belonged to a family in Jersey. On the day of our drive, the small black racer is celebrating its sixtieth—yet this historic 356 Speedster is still very active. She goes out for a spin nearly every day. That being said, it takes a good deal of persuasion before the little jewel is entrusted to me. The car’s owner refers to it as “she,” making it clear how close his relationship with her is. But when I tell him that I’m planning to take her on an extraordinary trip to Scotland and relive the golden era of the 1950s, he finally agrees. But not without imposing a condition: “When she returns she’ll be christened,” he says. He knows that I like to name my cars. “It’s a deal,” I reply. I lived in England for several years, and much of what I learned about the British—good manners, irony, and a love of cars—was thanks to my old friend Freddie. No one could be a better guide to rural Scotland than he, who continues to dress in timeless tweeds complete with elegant pocket squares. The first stage of our journey heads north from Loch Lomond through the Trossachs National Park and then into the Highlands. The landscape is austere but elegant. The heather lends a characteristic brown-violet touch to the scenery, while the usual gray-green shades and overcast skies provide a spectacular setting for each rare note of color. Intermittent shafts of sunlight break through the dark clouds to alight on a hollow in a row of peaks, or to bathe a swath of meadow in soft green light as if God himself were gazing down from the heavens on this vast and lonely land. Scotland can give you all four seasons in a single day, says Freddie, and you never know which one is coming next. Perfect for a Speedster, I think, and I suddenly know what to name her: Lady Misty. Driving on the winding roads of the Scottish Highlands, Lady Misty shows that she hasn’t lost any of her youthful energy. She is precisely the sports car I’ve always dreamed of. To hold the large round steering wheel in your hands and fly through the majestic landscape with an open top and the wind in your hair conjures up a feeling you’ll never forget. “Grand” is the term that immediately comes to mind. To my astonishment, Misty’s owner explicitly urged me to put the car through its paces. “No pussyfooting,” he warned, adding that the car doesn’t need coddling but rather a firm hand. And in fact a little double-clutching or a good push on the pedal does indeed help keep Lady happy. It’s amazing what you can get out of a sixty-year-old car. Even at a jaunty 70 miles per hour, the 55-hp, four-cylinder engine revs up even more, and easily hits 4,500 rpm. The faster I drive her, the calmer she becomes. “Don’t forget, it’s a Porsche,” I assure my passenger, who, as we approach a speed of 90 mph, is starting to reach for the handle on the instrument panel—the only appreciable piece of safety equipment in the spartan Speedster. The Scots have more words than the Inuit for snow and several hundred words for rain, but we are greeted the next morning once again by glorious sunlight. About 20 miles south of Pitlochry we reach Stanley, a village on the River Tay. 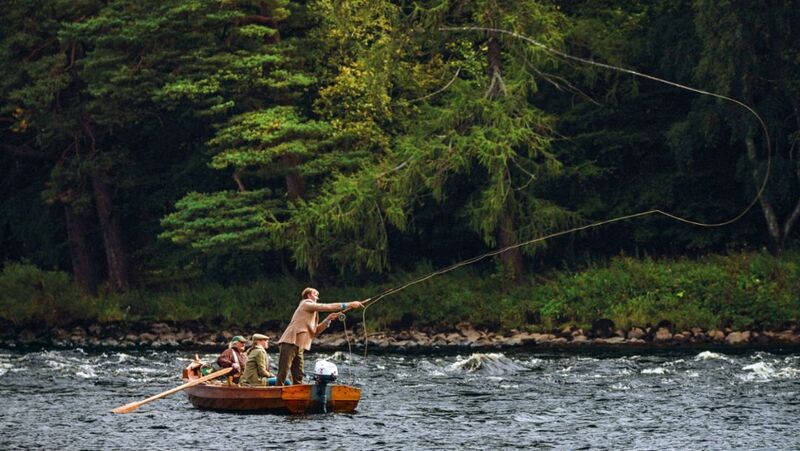 The longest river in Scotland, the Tay has attracted salmon fishers from far and wide for generations. One of them is Geordie, our ghillie (a hunting or fishing guide), who is cheerfully awaiting us at an early hour in a hamlet with the dreamy name of Otterstones. Scotland is a stronghold for this endangered animal in Europe. And although the otter has no natural predators, it sometimes competes with fishermen for the same stretch of the river. Many years ago Geordie had to appear in court for shooting one of the animals. “That wasn’t an otter, it was a wet squirrel,” he said in his inimitable Highland accent. Geordie has been coming to Otterstones for six decades now and has fished the same stretch of the river day in and day out. It is about 80 feet long. He must be on a first-name basis with each and every eddy and pebble. Geordie’s face is ruddy and his skin is weathered. “There, ye git a nibble,” Geordie calls, and Freddie swings his arm to set the hook in the mouth of the fish that is playing with the bait. False alarm. “Ye lost ’im,” he observes drily. Now it’s my turn to give it a try. My first attempt is pathetic. “A wee bit more,” says Geordie patiently. I swing the long line back again, pause briefly, and then hurl it way out in order to place the bait in the rushing eddies that the salmon must traverse en route to their spawning grounds. The gentry were the only ones who used to come here, remarks Geordie. Gentry, those are people like him, he says and points to Freddie with a grin. In other words, landed gentry. Queen Victoria made this area popular among the upper class—she loved the Scottish Highlands. In 1848, she and her husband Prince Albert purchased Balmoral Castle, where traditionally the Royal Family has spent many summers ever since. In the nineteenth century, the country’s elite followed their example, preferring the unsullied mountains to the coal-spewing chimneys of the cities. They purchased country houses and large estates, hosted hunting parties for their prosperous relatives, shot pheasant and wood grouse, and discovered salmon fishing as a sport. The Highland ghillies were highly sought after for their local expertise. They shared their knowledge of the land and its fauna with the wealthy visitors who came to Scotland to hunt and fish. We leave the Highlands behind and reach the county of Angus and the valley of Strathmore, famous for its highland cattle and also for Glamis Castle, once the home of Queen Elizabeth, the Queen Mother, seat of the Earl of Strathmore and Kinghorne, and the setting of Shakespeare’s Macbeth. The driveway to Glamis is about a mile long, straight as an arrow, and lined with centuries-old oaks. It leads to a Scottish castle looming behind the trees, looking for all the world like something out of a fairy tale. We are met by Simon Patrick Bowes Lyon, the nineteenth Earl of Strathmore and Kinghorne, the lord of Glamis, the great-great-nephew of the Queen Mother, and the first cousin twice removed of Queen Elizabeth II. As imposing as his titles are, the 29-year-old earl himself is down-to-earth, introducing himself modestly as “Sam.” His family history is closely interwoven with the history of Britain. Glamis Castle has been the seat of the Bowes Lyon family since 1372. The most famous recent member is undoubtedly Lady Elizabeth Bowes Lyon, better known as the Queen Mother. The mother of the current British monarch grew up in Glamis and bore her second child, Princess Margaret, here. More than 100,000 visitors tour the remarkable castle every year. Steeped in legend, the building and its 130 rooms are said to harbor both dark secrets and ghosts, who continue to haunt it to this day. Ordinary mortals are not allowed to spend the night at Glamis Castle. But we are visiting at the wish of the young earl, who is a close friend of Freddie’s and has a secret passion for automobiles. The head of the Bowes Lyon family is a car enthusiast—or, as the British might say, a “petrolhead”—with gasoline in his blood. His eyes shine as we get into the Porsche. He owns a collection of historic sedans, trucks, and tractors, including some rare prewar models. In the summer, Glamis Castle hosts the Scottish Transport Extravaganza, one of the largest events for vintage vehicles in Scotland. As a young boy the earl used to race up and down the long driveway, and he sometimes still does so. He recently clocked 130 mph, and his younger brother even hit 155. Smiling, he shows me the proof in the form of a short video on his cell phone and asks me not to tell anyone. “Of course not,” I vow. The earl and Lady Misty understand each other at once. “That’s the most expensive Beetle I’ve ever driven,” Sam jokes when I take the precaution of mentioning the value of our steed. It’s hard to imagine that Misty’s former owner acquired her forty years ago for a mere £650 (approximately $950)—today, the car would change hands for at least $720,000. Vintage cars are highly valued by the British, who famously honor tradition and passionately maintain their heritage. If you’ve ever been to automobile auctions at Bonhams or RM Sotheby’s, you’ve seen sums of money cross the table that other markets can only dream of. We pass the gatehouse with a high-spirited and almost Scottish-sounding rrrrroooaaarrr, which elicits an admonishing look from the guard. I make an attempt at the royal wave. The earl corrects me. “Move your hand as if you’re unscrewing a lightbulb,” he says and demonstrates. At the end of the tree-lined driveway we turn off into the small village of Forfar and then continue on into Strathmore’s vast expanse of gently rolling hills. In good weather, such as we have today, you can see Aberdeen to the north and the foothills of the Highlands to the west. But wherever you look, you are surrounded by fields, farmland, and meadows. All of this land belongs to the earl: 16,500 acres of it to be precise, including 1,778 acres of woodland. Managing the agriculture, the hunting grounds, and the forests is a major responsibility, as well as a lot of work. Sam has a big job ahead of him. And big plans. He dreams of using the property and the long driveway for an automobile and racing festival. He’d love to set up a rally stage right outside the castle and have every last nook and cranny reverberate with the powerful roar of the engines. We sit together that evening in the big drawing room, an incredibly imposing, rose-colored space whose vaulted ceiling displays elegant white stucco ornamentation. Ancestors of the Earl of Strathmore and Kinghorne gaze down on us from its walls. In the middle, two long divans stand before an open fire consuming a big log of wood. Two tiny chairs stand before it to the left and the right. “They belonged to Queen Elizabeth and Princess Margaret when they were children,” says the earl softly. When the Queen Mother died in 2002, 15-year-old Simon Patrick walked behind the casket with a bowed head along with the rest of the Royal Family. The chests of drawers and sideboards are lined with framed photos of the family and its famous members. One shows Prince Charles, Duke of Rothesay, and Camilla, Duchess of Cornwall, in the driveway at Glamis. Another, which must have been taken a few years before World War II, shows the Queen Mother—the earl’s great-great-aunt—and King George V standing next to the earl’s great-grandfather. And yet another has his great-grandfather, the uncle of the Queen, in the uniform of the Black Watch regiment. Glamis Castle was a military hospital back then, and young Elizabeth, the future Queen Mother, selflessly cared for wounded soldiers here. She started a tradition by laying her bridal bouquet at the British tomb of the Unknown Warrior. Many members of the Bowes Lyon family were lost to the war. So much unites our fate and fortunes, so much divides us. “Aye!” says the earl, with no need to say more. We walk back through the quiet rooms of the castle, which are filled with memories of the past and currently house only a single soul—not counting the ghosts. I ask whether it’s lonely to live in such a large abode. “It’s not a big building,” says Sam shyly, and I realize that he grew up in a very different setting than I did. The quietness does not disturb him. Sometimes he travels to London for a few days, but he does not stay in the crowded big city for long. “I’m a country boy,” he remarks. After everyone goes to bed, I sneak back through the dark halls to a low wooden door I had spotted during our tour. Set deep into the 16-foot-thick exterior wall of the stone stairwell, it had awakened my curiosity. I would like to see where it leads to. The ghosts of Glamis must look kindly upon me, because the thick key turns and the lock opens noisily. A ladder takes me up to the central nave and suddenly I’m in the open air looking out over the brightly lit towers of Glamis Castle. The night in Angus is dark, the black clouds are laced by the erratic flight of bats, and the banner with the coat of arms of the Earls of Strathmore and Kinghorne flutters majestically in the wind. In the distance I can make out the myriad gray shades of the Highlands, while soft music rises from below. I carefully lean over the parapet and there she stands, our Lady Misty, shining in the moonlight, finally in her element. A dense mist descends.